In order to help global assignees and their families succeed when relocating internationally, human resources departments in multinational organizations need to have state-of-the-art tools to manage employee mobility and they need to have a wellformed global HR strategy. 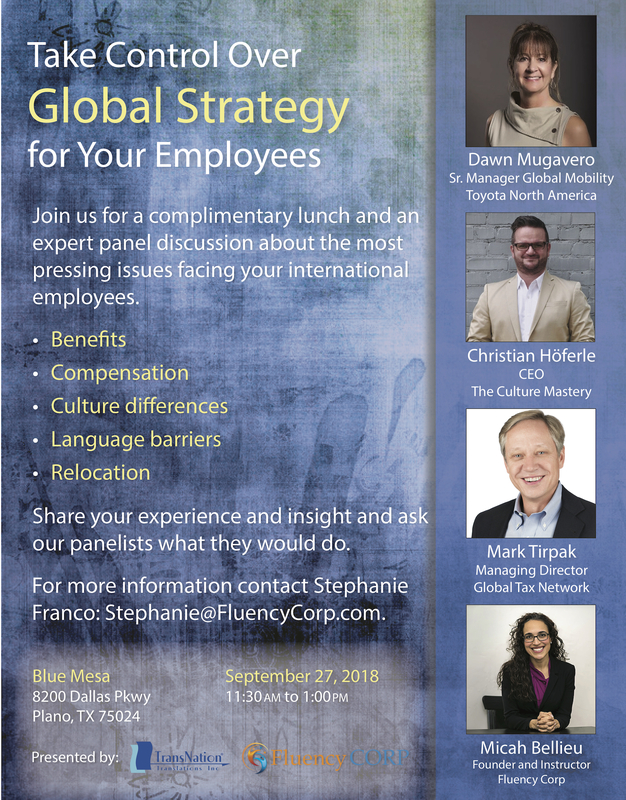 On September 27, 2018 language services firms TransNation Translations and Fluency Corp will host a lunch and learn session for human resources professionals in the Dallas/Fort Worth area. The luncheon will focus on global mobility issues and intercultural exchange. TCM founder Christian Höferle will be a speaker at this event and there will be a panel discussion with Dawn Mugavero (Toyota North America), Mark Tirpak (Global Tax Network), and Micah Bellieu (Fluency Corp), moderated by Michael Ward (TransNation). This group of experts will highlight current trends in the industry and talk about best practices. This is a private event and an RSVP is required since space is limited. If you are interested in attending please email Stephanie Franco to get on the list.